When is a cafeteria more than a cafeteria? When it’s a bustling drop-in tutorial space for first-year science students. Go inside FRezCa, the first-year residence cafeteria tutorial. During a typical weekday lunch rush, hundreds of hungry students pack into the Royal Victoria College Dining Hall. Dinnertime is just as busy. But, for a few hours in between the craziness, the room is a relative ghost town. 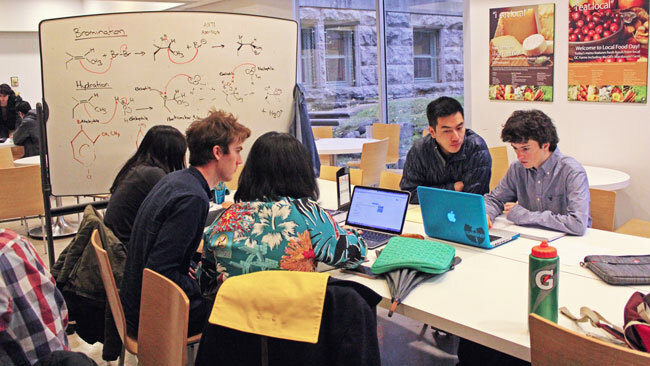 When Jim Avik Ghoshdastidar, a PhD candidate in the Department of Chemistry and a TA for CHEM 110, noticed this, he didn’t just see empty tables – he saw an opportunity for hands-on homework help. Ghoshdastidar is a big believer in bringing academics into residence life. He’s lived in rez for nine out of his own 10-year (and counting) academic career, beginning with Queen’s, where he did his two undergrad degrees, then Acadia for his Master’s. In the four years that he’s been at McGill, he’s lived and worked in student residences as either a faculty mentor or a Hall coordinator. “When I was a TA at Acadia, we started a help center and I liked that model of providing one-on-one help support,” says the Cambridge, Ontario, native. In the two days before last year’s CHEM 110 final exam, he experimented with the idea of doing something similar at McGill by conducting what he called the Residence Travelling Roadshow: 24 hours of office hours, held in two- and three-hour blocks at nine different student residences. This year, he’s trying a different approach by spreading out the time over the semester – and putting down roots at RVC. Ghoshdastidar reports that the average CHEM 110 midterm grades were higher this semester than in the past—thanks not only to FRezCa, but to other recent initiatives to increase supplemental learning, such as SciCram (free, 4-6 hour midterm and final exam reviews led by TAs) and online homework. (Earlier this year, Ghoshdastidar also won a “mini-grant” from the SALTISE organization for his project to use video podcasts to increase TA accessibility.) Higher grades are fantastic, no question, but he’s also excited about changes he’s seen in overall student engagement—which is no small feat for introductory courses that have hundreds of students.